We can brand any of our games with your company logo(s). Minimum quantities will apply in certain cases. Contact us here for a discussion on any of the games and options illustrated. If you require more bespoke versions of the games, please visit our bespoke products page here. Three of the squares of an existing theme of our eco action snakes + ladders game are co-branded with your logo. 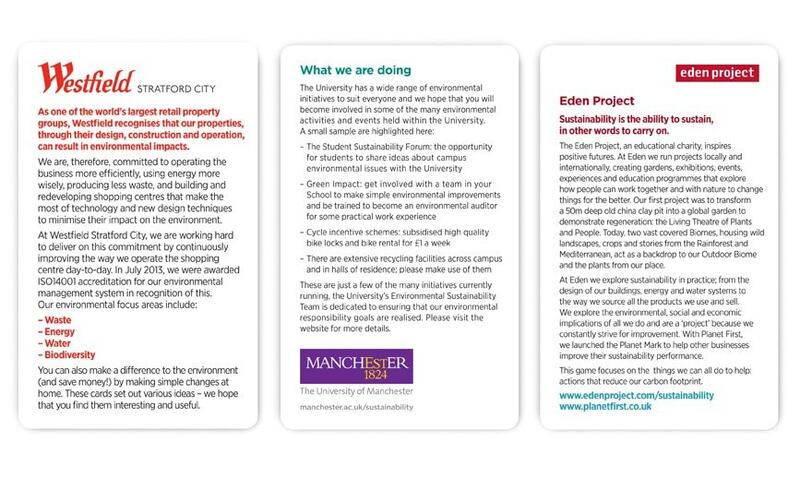 Alternatively four of the squares can be branded with 2 seperate logos.Currently 8 themes are available to brand: everyday (home) actions, free & easy actions, water saving, energy saving, waste & recycling, food waste, air quality or office based actions. The game is made from a sturdy PVC material, with metal eyelets around the edges of the board for outdoor use. The board is 2.4m2 and is delivered rolled. It also comes with two giant inflatable dice. A minimum quantity of 1 board apply to this product. We also produce the game in a lighter fabric that is made from 100% recyclable polyethylene, and biodegradable plastic eyelets. This version can only be bought in minimum quantities of 10, and comes in the 2.4m2 size, and the extra large 3.1m2 size. 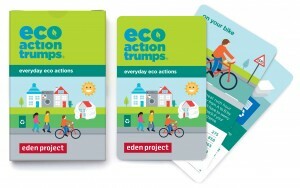 We can also personalise our giant eco action toppers and play your eco cards right. 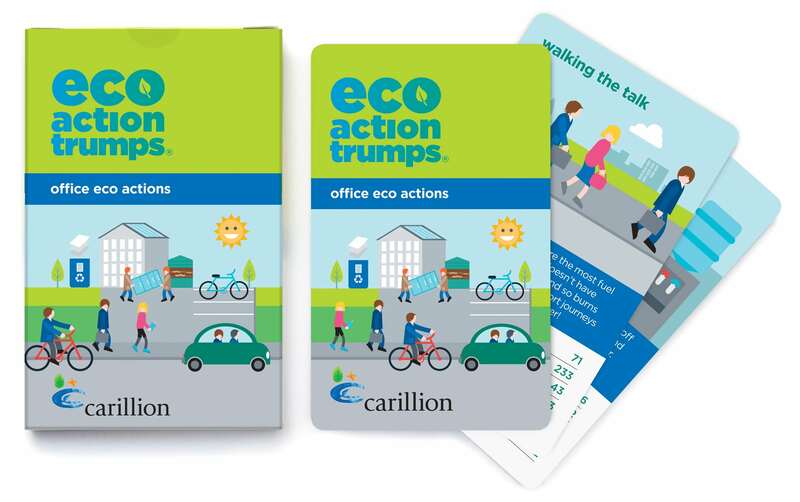 The cards come in A4 size and are made of sturdy, recycled/FSC card and are laminated for extra protection. The back of each card is branded with your logo. They come in a cardboard box which is not branded. You can choose between one or two logos to be added to the cards. Minimum quantities for this game is 10 sets of cards. You can have 5 of one type and 5 of another.